This is the third article in our discussion of dominant trees. If you missed the first two articles click here for the definition of a dominant tree and here to learn how to identify one. You should also take a look at this discussion of the differences between the two main families of oak trees. The focus of that article was on the quality of the acorns produced by the various species of oaks. In this article we are going to talk about factors that influence the quantity of acorns produced in an area or by an individual tree. Although deer will tend to seek out the most nutritious, best tasting foods, there must be a sufficient quantity of the food available in order for the deer to develop a pattern of feeding on a specific tree - which is where we want to hunt. Many external factors can reduce the number of acorns produced in a given year. Weather plays a big role. A late spring freeze like we experienced in 2007 can kill the oak flowers that normally develop into acorns. A dry summer can cause the tree to conserve resources by limiting the number of acorns that develop to maturity. Interestingly, too much rain can even be a problem. If heavy rain occurs in the spring when the flowers are blooming, it can wash away the pollen needed for fertilization. Several types of insects, particularly weevils, lay their eggs in the developing acorns. After the eggs hatch the insect larvae remain in the acorn feeding on the nutritious insides. Deer will not eat acorns that are infested with insect larvae. You can break the acorns open (I usually bite them) to determine whether they have been invaded by insects. Compare the good acorns pictured above with the infested ones. You can click on the picture to get a closer look. Generally, an acorn producing tree will not produce large quantities of acorns every year. Disregarding the influences of weather and insects, white oaks tend to produce large numbers of acorns every three years, red oaks every four years. Interestingly, when one white oak in an area has a good year, the other acorn producing white oaks in the are tend to do well too. This is not the case with red oaks. Notice I said acorn producing trees. The majority of oak trees in a population do not produce acorns at all. In a study conducted in Pennsylvania, only about 30% of large healthy white oak trees produced acorns, even in a good acorn year. Of that 30%, an even smaller fraction produced a "good" crop. So as deer hunters, how are we going to locate those acorn producing trees to determine whether they are a dominant tree. If you hunt an area year after year, you will be able to pattern the particular trees that tend to produce acorns with regularity. If you are searching for dominant trees in an unfamiliar hunting area, there are a couple rules of thumb you can remember to help locate productive trees. Keep them in mind, and use them to help narrow down your search. 1. Size is important. 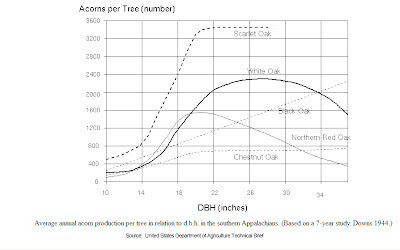 Take a look at this graph which shows the average number of acorns produced per tree relative to the diameter (DBH stands for Diameter at Breast Height) of the tree. Click on the graph for a larger version. As you can see, larger trees produce more nuts (up to a point with most species). As an example, look at the line for white oaks. On average a 26 inch diameter tree will produce almost twice as many acorns as a tree that is only 8 inches smaller! 2. Trees that have access to sunlight will produce more acorns than those that are shaded by larger trees. The best producing trees are generally ones that have a majority of their limbs open to the sun on all sides. Scouting Rule of Thumb #2: Look for trees that are taller than the surrounding canopy. 3. Trees need access to nutrients, including water, in order to produce acorns. Trees that acquire the necessary nutrients generally have dark green leaves. Trees that do not are usually yellowish-looking. Scouting Rule of Thumb #3: Look for trees that are dark green in color. Of course these rules of thumb assume you are able to identify an oak tree from the hundreds of other trees in the woods. If you haven't yet learned to distinguish the various oak species, or if you just need a refresher, start here.